May | 2013 | Relaxed. Transitioning. Natural. Beautiful. I stumbled across an old jar of Elasta QP Glaze in my stash (from when I was relaxed) and thought I’d see how it would work on my newly natural hair. This is definitely a “conditioning shining gel.” It left my hair soft with a crazy amount of shine. No kidding! It gave better shine than an expensive shine serum. And, believe me, I’ve bought plenty over the years. So, be careful not to add too much, or it will leave your hair feeling too oily. I know! It’s hard to believe, but it’s the gospel truth! I think this glaze is perfect for those who can’t or don’t use gels in their hair care routine. 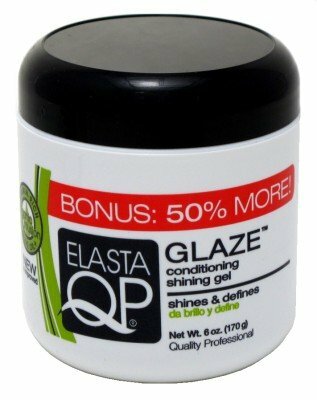 Unlike a traditional gel, Elasta QP Glaze won’t leave your hair crunchy or hard to the touch. Of course, the downside is that it doesn’t have a strong hold, but if you only want a light hold, that shouldn’t be a problem. I truly love this product! In fact, I think I like it more now that I am natural. It locked in the moisture in my hair all day long and left my coils feeling silky. I layered it on top of my moisturizer and a light oil. It REALLY defined my old twist-out. It also worked well to smooth and de-frizz my edges. And, this washes out easily. I had absolutely NO product build-up!